Whenthe space shuttle Endeavour leaves the International Space Station (ISS),skywatchers across much of the United States and southern Canada are in for areal treat early on Saturday and Sunday morning. Weatherpermitting, there will be opportunities to seethe space station and Endeavour and the ISS flying across the sky from manylocations once the shuttle undocks from the orbiting lab Friday night. Thesight should easily be visible to anyone, even from brightly lit cities. Considering that after this mission there will be only be four flights leftbefore the spaceshuttle program ends (tentatively in September) the view of a shuttleorbiter and space station flying in tandem will soon be a sight that will passinto history.?? 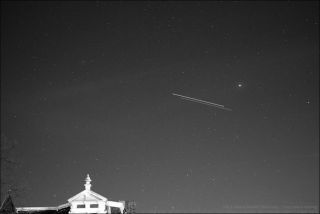 Theappearance of either the space shuttle or the space station moving across thesky is not in itself unusual. Onany clear evening within a couple of hours of local sunset and with no opticalaid, you can usually spotEarth-orbiting satellites creeping across the sky like moving stars.Satellites become visible only when they are in sunlight and the observer is indeep twilight or darkness. This usually means shortly after dusk or beforedawn. Whatmakes the prospective upcoming passages so interesting is that you'll be ableto see the two largest orbiting space vehicles in the sky at the same time. ShuttleEndeavour is expected to undock from the ISS at 7:54 p.m. Eastern StandardTime on Friday.? Endeavour will fly around the ISS before finally pulling awayfrom the Station at 9:38 p.m. EST, although it should still remain at arelatively close distance to it until its scheduled return to the Kennedy SpaceCenter in Florida Sunday evening. Bothvehicles will be traveling across North America on northwest-to-southeasttrajectories. Appearingas a pair of very "bright stars," the ISS should appear as thesomewhat brighter object and will be trailing Endeavour as they move across thesky. ?The pair should appear only a few degrees apart on Saturday morning, butthe gap between the two will likely widen to perhaps 20-degrees or more bySunday morning (your clenched fist held at arm's length measures roughly10-degrees; so on Sunday morning expect? Endeavour and the ISS to separated byabout "two fists"). Alarge telescope would be needed to make out details of the sprawling station.Traveling in their respective orbits at approximately 18,000 mph (29,000 kph),both should be visible anywhere from about one to five minutes (depending onthe particular viewing pass) as they glide with a steady speed across the sky. Becauseof its size and configuration of highly reflective solar panels, the spacestation is now, by far, the brightest man-made object currently in orbit aroundthe Earth. ? Onfavorable passes, it approaches magnitude -5 in brightness, which would rivalthe planet Venus and is more than 25 times brighter than Sirius, the brightest starin the night sky. Some have even caught a glimpse of the ISS just prior tosunset or shortly after sunrise. And as a bonus, sunlight glinting directly offthe solar panels can sometimes make the ISS appear to briefly flare inbrilliance.??? Generallyspeaking, the tandem will be visible across southern Canada and most of the 48contiguous United States (Hawaii and Alaska will not have favorable viewingpasses during this upcoming week). ? Acrosssouthern Canada and the northern half of the United States there will be two orthree morning viewing opportunities. For some favored locations, like Chicagoand Milwaukee there will be as many as four opportunities. ? Overthe southern United States, the viewing opportunities will be reduced to justone. Much of Florida (save for the Panhandle), central and southern Georgiaand parts of western and southern Texas will be unfortunately be denied a viewof the "dynamic duo" because they'll appear too low in the sky andtoo near to sunrise to be easily visible. Incontrast. some localities will be favored with exceptionally good views. FromMilwaukee, for instance, the ISS and the Shuttle will appear to soar to analtitude of 86-degrees — virtually overhead — during a 4-minute overfly beginning at 5:53 a.m. Central Time. Europeanswill also be favored with views in their pre-sunrise skies. London, forinstance will have four opportunities to see the Endeavour and the ISS: two early on Saturday morning and two more on Sunday morning. ? Thebest of these will come on Saturday beginning at around 05:47 GMT. The twospacecraft will appear to emerge from the Earth's shadow low in the west-southwest,quickly reaching a maximum altitude of 28 degrees up in the south-southwest,then taking another two minutes to glide over toward the south-southeasthorizon before finally disappearing from view. So what is the viewing schedulefor your particular hometown? You can easily find out by visiting one ofthese four popular Web sites: Chris Peat's Heavens Above, Science@NASA'sJ-Pass, NASA's SkyWatch and Spaceweather.com. Anothergreat site is this one, whichprovides real-time satellite tracking and shows you at any given moment duringthe day or night over what part of the Earth the ISS or shuttle happens to be.???? Endeavour?ssix-astronaut crew is wrapping up a 14-day mission to the space station. Theastronauts performed three spacewalks and tricky robotic arm work to install abrand-new room called Tranquility and a stunning observation deck to theorbiting laboratory. Theshuttle is due to land Sunday night at 10:20 p.m. EST (0320 Mon. GMT). Joe Rao serves as an instructor and guest lecturer at NewYork's Hayden Planetarium. He writes about astronomy for The New York Times andother publications, and he is also an on-camera meteorologist for News 12Westchester, New York. Click herefor shuttle mission updates and a link to NASA TV.